This is another species that flowers several times each year and is coming back into flower after blooming last in February. This species is endemic to Peru where it grows between 2000m and 4000m as a terrestrial on rocky slopes amongst grasses. This explains the long flower spikes which carry the flowers well clear of the leaves and in reach of pollinating humming birds. 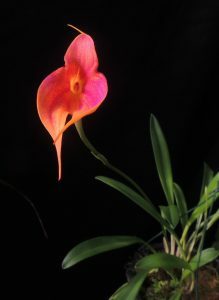 The colour of the flowers is quite extraordinary with the glowing orange ground and iridescent stripes of red or purple. 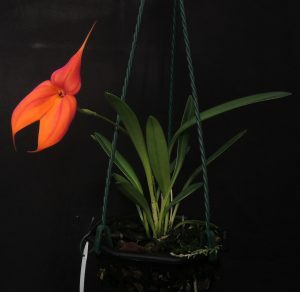 Close inspection reveals that the red areas of the flower are produced by tiny purple hairs that cover the orange sepals. The Incas call the species Wajanki. We grow the species in baskets in Cool Americas. This lovely species is variable as shown by the two clones we have flowering at present offering the opportunity to produce viable seed for the laboratory.